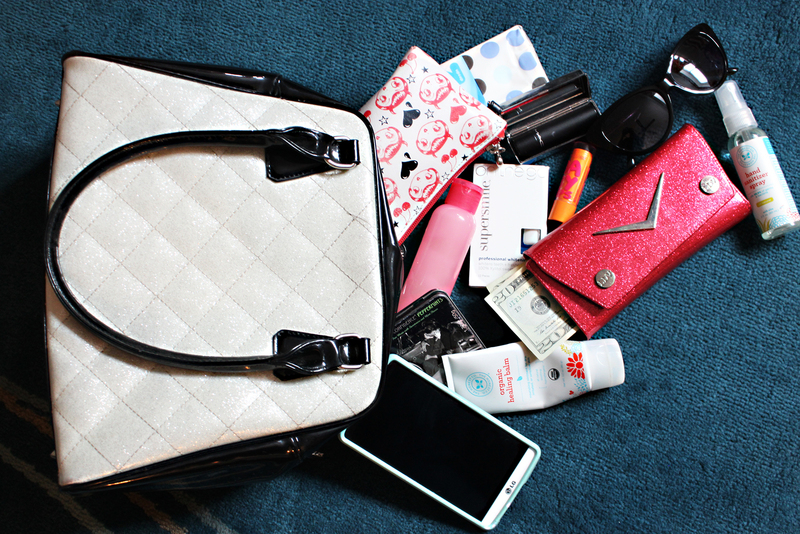 Have you ever wondered what a new mama carries in her handbag? Since being a mom to a toddler that loves purses and going through them, I have definitely downsized! I carry the bare minimum and try to keep my bags small to medium sized. I like this Lux Deville Bon Voyage Tote in black and silver sparkle, it is very roomy but not huge and it’s manageable when you are carrying a baby as well. You can get this bag here. The only thing I wish it had is a cross body strap! As mentioned above, I only carry what I need on a daily basis and it changes based on where I am going. 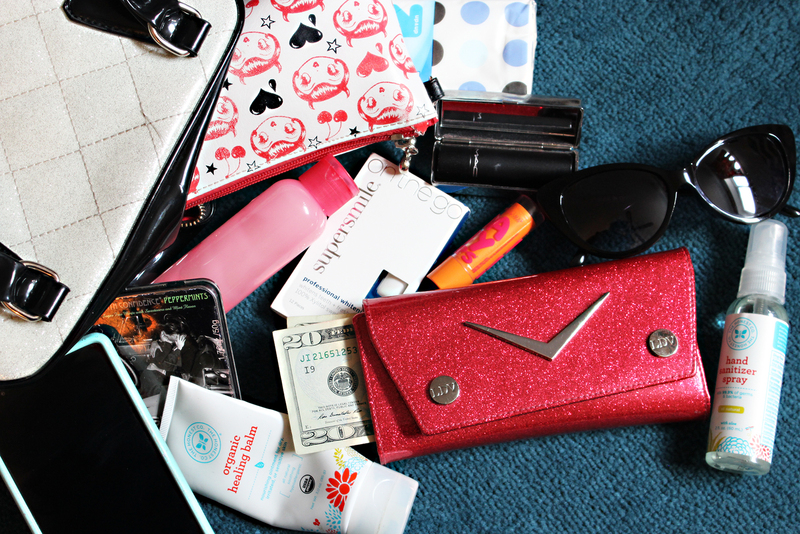 If I am just running to the grocery store I take my wallet, makeup bag, cell phone, lip balm, and sunglasses. If I am going out for the day I usually take what you see in the photo. 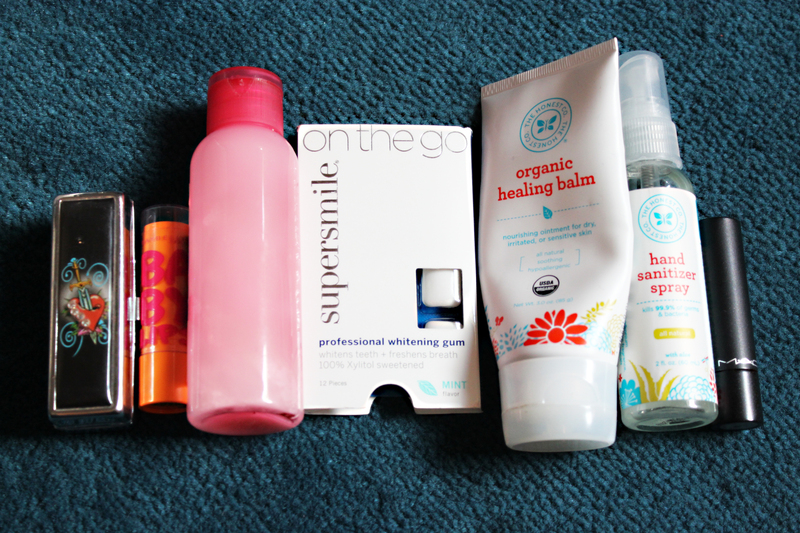 I like to have The Honest Company Hand Sanitizer and Healing Balm on hand to keep my hands clean and hydrated on the go. I have a small mint tin from It’s Sugar that has a cute photo of a vintage couple kissing on it that I use as a medicine case. I like to be prepared! I also throw in a small pack of tissues and a travel size bottle of The Honest Company Lotion. Lastly, I have my Mac Prolong red lipstick and lipstick case if I need to go somewhere last minute and have to dress up my look. I wear red lips on the weekends and during the week if I am going somewhere, but not if I am just going to be around the house. Items: Wallet- Lux Deville, no longer available, similar version here. Makeup bag- Fluff- no longer available but there are quite a few on Amazon. Sanitizer and Healing Balm available at The Honest Company. Mac Prolong lipstick in Prolong available here. Supersmile whitening gum available here. Black Cateye Sunglasses purchased from Ebay. I hope you enjoyed this post. Stay tuned for more.